This week I went through a bit of milk craze. I made my own milk every second day and enjoyed drinking it for breakfast. 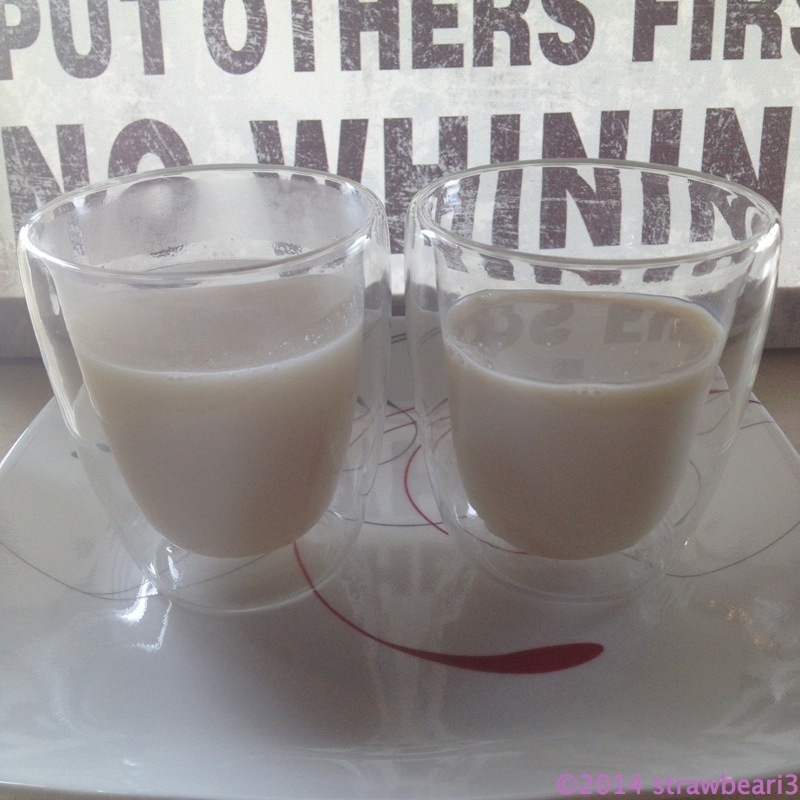 I got the idea after seeing the soy milk recipe in the Thermomix Taste of Asia cookbook. The instructions looked easy and the only ingredient I needed was soy beans. I headed to the shop the next day and bought a 1 kg bag of soy beans for about $3.50. The only set back was that the beans need to soak overnight. It meant I couldn’t make it straightaway, but it was easy enough for me to make it in the morning before work. Since I discovered how easy and enjoyable it was to make my own milk, I have been reading around on other types of milk and the recipes for making them at home. Rice milk was my next option, simply because I have some brown rice at home. I have tried rice milk from the supermarket but really disliked the taste. However, this one took my by surprise and I quite enjoyed it. 1. Pour drained beans and 400g of water into the TM bowl. 2. Blend for 1 minute on speed 8. 3. Add remaining water, sugar and vanilla essence. 4. Cook for 10 minutes at 90˚C at speed 2-3. 5. Boil for a further 2 minutes at 100˚C at speed 2. If the mixture starts to boil over, turn it off. 6. Strain and serve warm / cold. Benefits: Low in saturated fat and cholesterol free. There is a lot of controversy (good and bad) about the effects of soy, but I think everything in moderation is good for you. 1. Pour rice and 500g of water into the TM bowl. 2. Cook for 20 minutes at 100˚C at speed 2. 3. Add sugar and blend for 4 minutes at speed 10. 4. Add 500g water and cook for 2 minutes at 100˚C at speed 2. Benefits: Low in saturated fat, cholesterol free. Good for people with allergy. However, it is also low in calcium and protein. Will this be a fad or will I go back to buying bottled milk from the shop?